Most COASSTers, once they have been at it for a while, get to know their beach pretty well. They become attuned to the subtle shifts and changes of its features—the eroding bluffs, say, or beach grass as it creeps across the dunes. These features are proxies for time: not only a way to witness the natural world’s inherent dynamism, but also a visual measure of a volunteer’s commitment to a place. For Paul Allan, the feature that best marks his time on Bishop’s Beach West is a rusted van someone pushed off the bluff. “It was just lying there, so we had to report it as a large piece of marine debris,” he says. That was four years ago. Since then, he has watched the van slowly disintegrate, watched the waves and tide push it around and partially bury it. “It’s like Mother Nature is bringing it back into the fold, little by little,” he says. 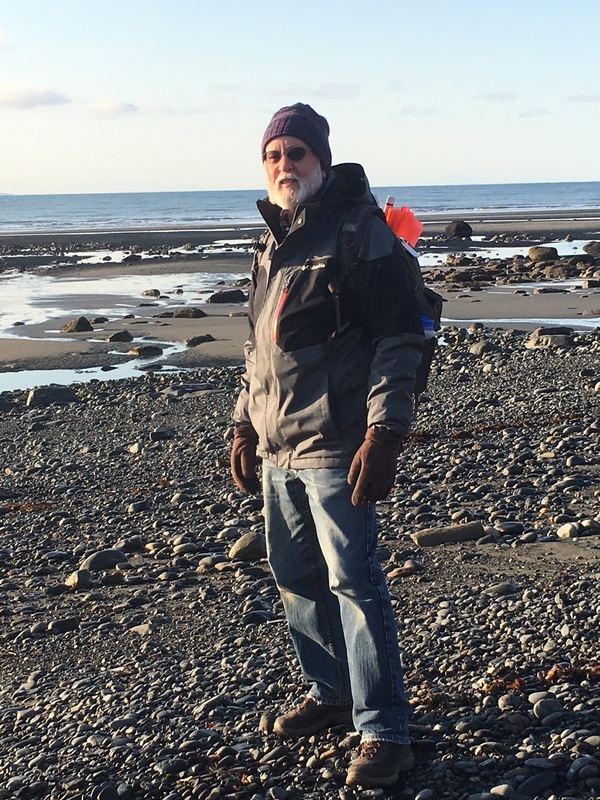 Paul and his wife, Louise Ashmun, started volunteering with COASST in 2014, when they moved to Homer, Alaska. For them, it was a return to the last frontier; they had lived in Alaska for twenty-odd years before heading south to Seattle, Washington, so Louise could train as an engineer. After graduation, she got a job with the U.S. Forest Service in Moscow, Idaho, while Paul continued working in science education. As a classroom teacher, he mostly taught physics, but also oceanography, chemistry, and math through calculus. He ended his career at the University of Idaho, where he was the program manager for the university’s GK-12 program, an initiative run by the National Science Foundation that helps graduate students hone their communication and teaching skills. Then one of Allan’s daughters started working as an environmental toxicologist for NOAA in Anchorage, so in 2013 Paul and Louise flew up to visit. This entry was posted in Participant Profiles on 3. January 2018 by coasst.